Italian President Giorgio Napolitano has asked a select group of people to offer a policy platform to end the impasse in forming a new government. He named 10 "wise men" to work in two separate groups. His announcement ended speculation that he might resign - a day after political parties failed to agree a coalition government following February's inconclusive election. Mr Napolitano said he would serve out his mandate that ends on 15 May. Italy has been governed by a group of technocrats led by Mario Monti since late 2011 - when centre-right leader Silvio Berlusconi resigned in the middle of an acute economic crisis. 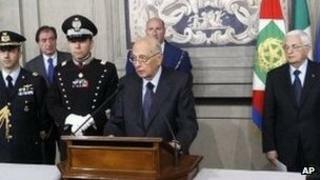 President Napolitano said that Mr Monti's caretaker cabinet was still "operational" and "in charge". However, the continuing political stalemate is delaying reforms that could help revive Italy's recession-hit, debt-laden economy. The president finished consultations with Italy's main political leaders on Friday. In the absence of agreement, Italian analysts had said Mr Napolitano was contemplating quitting to enable a successor to try to form a new cabinet or dissolve parliament and call new elections. But the president announced that he planned to stay on "to the end". Instead, he said he asked "two small groups of personalities" to formulate "precise programme proposals" that could be supported by political parties - and serve as a basis for a new cabinet. The first group will be asked to work on pressing political and institutional issues, while the second will focus on economic and social problems. Among the 10 "wise men" are Enrico Giovannini, head of Italy's Istat statistics agency, European Affairs Minister Enzo Moavero Milanesi, Bank of Italy deputy director Salvatore Rossi and Valerio Onida, a former judge on the country's constitutional court. "I want to underline one more time the need for all political parties to demonstrate their full awareness of the gravity and urgency of the problems facing the country," Mr Napolitano said. There has been talk of the possibility of the president ultimately seeking to form a temporary, technocrat-style administration, the BBC's Alan Johnston in Rome reports. He adds that for the moment nothing is clear, except that Italy's political paralysis continues. The country's parliament is currently split in three main blocs - each without enough seats to govern alone. Pier Luigi Bersani's centre-left coalition won the most votes in the February election, but failed to secure a majority in both houses of parliament. The bloc has ruled out an alliance with Mr Berlusconi's centre-right alliance, which finished a close second. The protest group Five Stars Movement led by former comedian Beppe Grillo garnered a quarter of the vote, but has refused to support either group.